American Salon Royal Hair Keratin Treatment is a new trend in the beauty-industry, magnificent way to return the hair smoothness, shine and vital strength. Keratin treatment by Salon Royal Hair gives the super long effect - hair remains straight and smooth for about six months. Keratin treatment – hair straightening is one of the most popular salon procedures in many countries. Salon Royal Hair represents the premium segment of professional cosmetics, it is the global leader in long-term hair straightening and treatment. For here on out curling, damaged and weakened hair is not a problem! Straightening nutritious structure of the Salon Royal Hair Keratin Treatment on the basis of a natural keratin straightens hair ideally and restores their structure at cellular level. Salon Royal Hair Keratin Treatment is ideal for fight against natural oxidation of the lightened hair. Only one procedure will give the natural shine and strength, will restore structure and will make them improbably elastic and easy in styling. The unique effect of the Salon Royal Hair Keratin Treatment line is possible because of natural components in these products. Proteins strengthen hair, amino acids give them shine and smoothness, provide an additional feeding and smoothing, collagen and keratin prevent fragility, but green tea extract, coconut oil and jojoba oil, kiwi and citrus feed head skin, restoring hair health and strength from inside. Even the curling, damaged and weakened hair becomes smooth, shining and silky after the procedure. The highest quality of the Salon Royal Hair Keratin Fiber Reconstructor. Unique features are provided by the maximum contents of the hydrolyzed keratin, amino acids and natural components. The guaranteed result of straightening procedure. 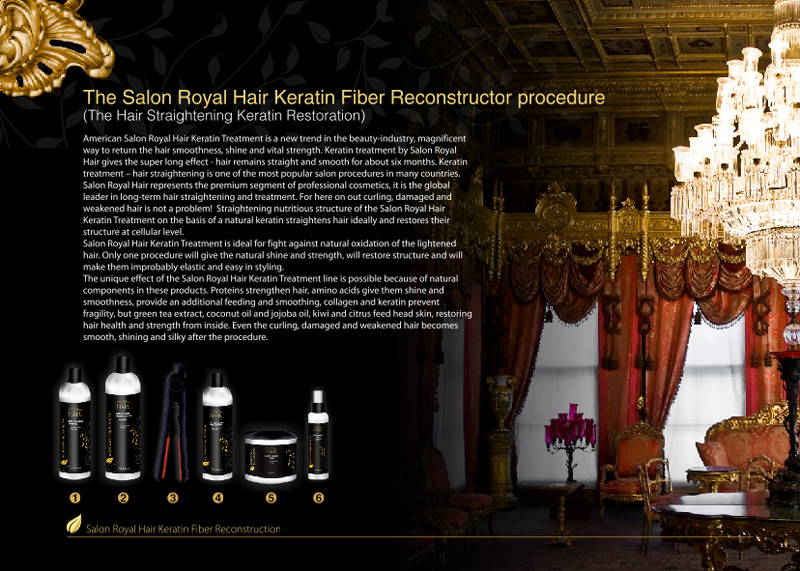 The Salon Royal Hair Keratin Fiber Reconstructor (Straightening Keratin Restoration) yields instant result. Success is guaranteed because of special products for thin and wavy, tight and curly hair. Complex application of all products included in the Salon Royal Hair Keratin Treatment line and special equipment guarantees excellent straightening, deep restoration, treatment and preservation of hair well-being. The excellent endurance of hair straightening and treatment effect. It is attained because of possibility to use professional Salon Royal Hair products at home. At the correct care hair remains ideally smooth and brilliant for about six months. The maximum comfort during procedure for the master and the client. Due to exact hair type definition and application of necessary products in certain quantity, evaporations are minimized. Profitable prime cost. One of the most expensive products for the long-term hair straightening, the Salon Royal Hair Keratin Fiber Reconstructor is the leader at the low procedure cost. The economic product minimizes expenses due to the high concentration. The real record: only 35-40 grams of the product are required for hair of average length. Thus, at observance of the recommendations, you will need one liter of product for about 30 procedures. For here on out curling, damaged and weakened hair is not a problem! The innovation from Salon Royal Hair — straightening nutritious structure on the basis of a natural keratin. Hair Keratin Fiber Reconstructor straightens hair ideally and restores their structure at cellular level. It is suitable for hair of any type and yields instant result.